With just four corners and a lap half the length of most other, it’s easy to jump to the conclusion of the Norisring being quite a straightforward circuit. Nothing, however, could be more wrong. The former parade streets around the 360-metre “Steintribüne” grandstand feature the bumpiest tarmac of the year, with grip levels not being helped by an array of painted traffic lines on the track surface. The layout is dominated by two tight hairpins – one at each end – making traction and braking the two most important parameters in car set-up. Sticking with the aspect of braking, slowing the cars down in an effective way will be one of the most significant challenges for the drivers, with heavy braking zones made even more difficult by twisting entries to the corners. The Norisring puts a premium on mechanical grip, as opposed to the aerodynamic performance required by more traditional venues. 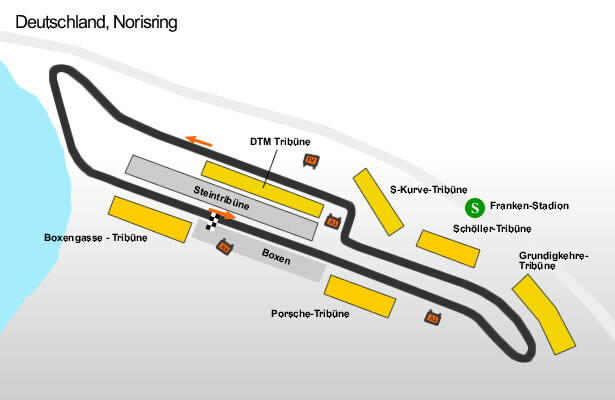 The room for mistakes (the DTM meeting sees about 100 concrete walls and three layers of Armco barriers installed around the track) is highly limited – particularly in the fast Esses on the back of the circuit. The Nuremberg streets require drivers to slowly build their confidence between the walls, making a trouble-free practice session on Friday vital for the acclimatisation process.